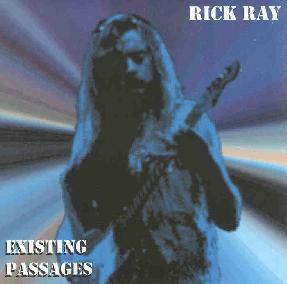 Rick Ray - "Existing Passages"
While this may indeed be an album of outtakes and unfinished pieces recorded between 1999 and 2000, you would not for the most part know it. Mostly every piece sounded complete to me, with the exception of maybe the brief Beginning to Scream, which was more or less just a bit of a guitar idea (though a cool one, nonetheless!). But the rest of the album is a great collection of songs that demonstrates not only Ray's soaring talents on the guitar, but also his love of music from the 60's and especially the 70's. Two of the biggest influences I hear in Ray's music are The Beatles and Frank Marino, but I also hear subtle shades of Rush, Blue Oyster Cult, John McLaughlin, Steve Morse, and maybe even a little Pink Floyd. Ray is equally comfortable in a number of styles, whether it be instrumental jazz-rock (Missing You, Dominion, Headed Towards Nothing) or Beatlesque pop (Bubblehead, You Say You Mean, Made to Last - sometimes his voice sounds so uncannily like John Lennon that I thought I was actually listening to a lost Beatles track!). Other standouts are Door to Nowhere, a lovely duet between acoustic and electric guitars and the amazing Can't Take the Plastic, a spacey and fiery rocker that rants against a mechanized and plastic future that Ray fears is coming upon us far too quickly. Many of Ray's lyrical concerns look towards the future with both despair and hope. They are often Biblical in nature, as Ray has definite Christian beliefs, especially concerning the Book of Revelations. If that's not your cup of tea, don't let it turn you off the music. Ray isn't preaching, he's just expressing what he sees and believes in the world around him in an intense and thoughtful manner. The fact is, the lyrics fit in perfectly with Ray's dazzling guitar pyrotechnics, emotionally expressive playing, and his knack for interesting melodic hooks. I haven't heard Rick Ray's other albums, but if these are his outtakes, I imagine the rest of his work must be pretty outstanding. Nonetheless, this is a great album of thoroughly enjoyable songs that stands on it's own as a worthy addition to your collection.